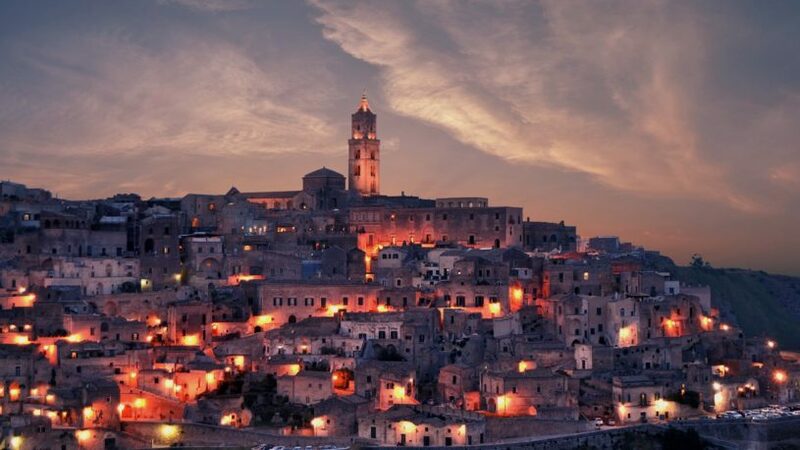 Matera European Capital of Culture 2019. 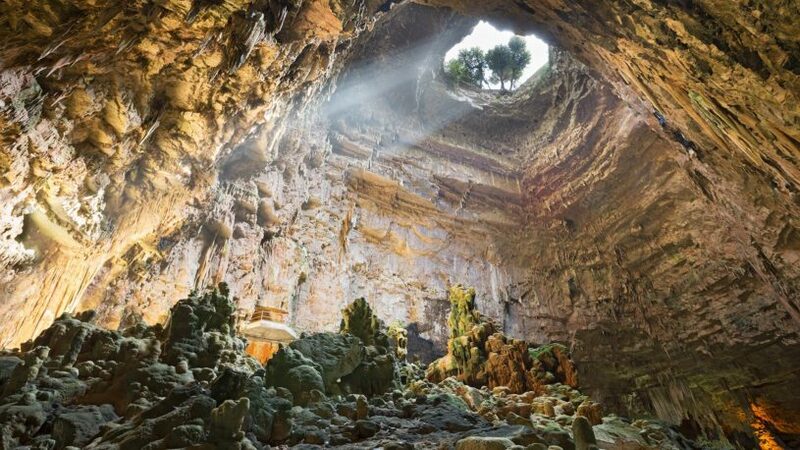 An entire city carved in the rock, along the slopes of deep canyon called “Gravina”, extraordinary testimony of a civilisation which lived in undeground homes while maintaining a harmonious relationship with its natural environnement. A unique city, included in the Unesco World Heritage list in 1993, Matera has been the set of major film productions, from Pasolini to Mel Gibson, who in the tortuous “Sassi” has filmed the scenes of one of his most important film, “The Passion”. It’s a strip of land that owes its name to the Madonna ODEGITRIA, (which means “she who showes the way”). The city of Martina Franca, dominates the valley, and it’s known for the Baroque Style of the historic centre, but also for an important symphonic opera festival, the “Festival of the Itria Valley”. From the Belvedere of Martina Franca, it can be seen Locorotondo, one of the most beautiful towns in Italy, famous for its circular layout of the old town and houses ending with unusual pointed roofs called “Cummerse”. Heading towards south you can make a stop in Cisternino, where every evening tourists from around the world enjoy the “gnummeredde”, tasty meet rolls, seated at the tables of the many butches shops of the historic centre. It is a name that indicates a part of the southern Apulia with a strong historical identity and includes the provinces of Brindisi and Lecce. Among the most beautiful places in this part of Apulia, Lecce is definitely a destination to be seen. Called “the Florence of the South” is rich in Baroque art that enriches palaces and churches, all built with the typical local stone. 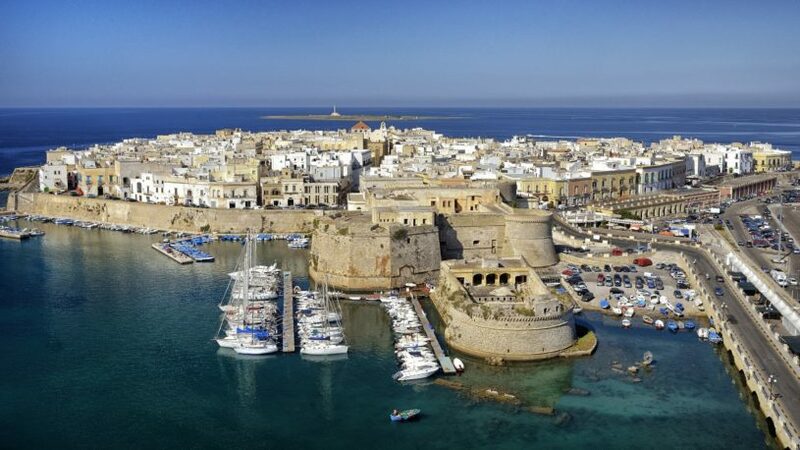 On the coast, instead it is a must stop in the elegant Oriental-looking city, Gallipoli, one of the most fashionable destinations of the Apulian coast, famous for its white sandy beaches and fine frequented by fans of beach volleyball, windsurfing and kayaking. On the Adriatic coast, Ostuni, known as the “White City” and Santa Maria di Leuca, on the tip of the region. Unique city, Alberobello has been included into UNESCO World Heritage Site in 1996. 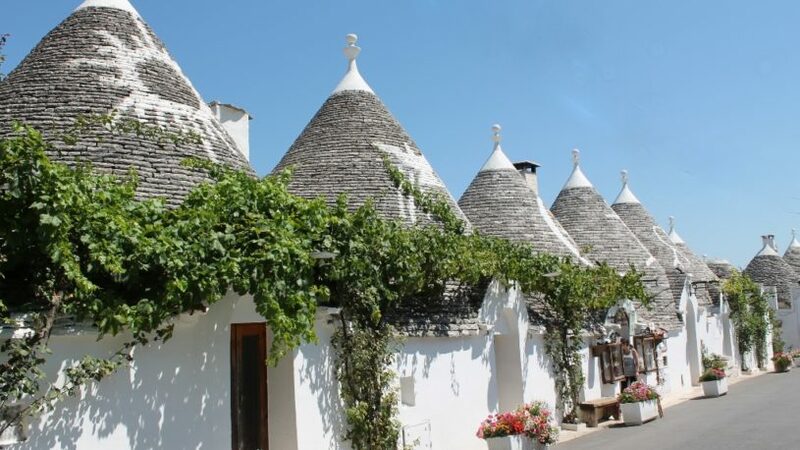 The town has perserved its historical core composed entirely of Trulli, the typical houses with the roof in the shape of a cone, built with stone and whitewashed with lime. From Alberobello in a few minutes you can reach the Castellana Caves, the most important Speleological complex in Europe that offers visitors a breathtaking sight: huge natural stalagmitie stalactites and spectacular galleries are articulated in three kilometers of underground streets, results of erosion of an ancient underground river that has dug the limestone rock for centuries. The “Park of the Gravine”(a sort of canyons) is a vast territory that includes three provinces with a concentration of unique rock settlements in Western Europe. Ginosa there are the most important examples of this ancient civilization, with hundreds of caves that once were homes but also religious circles. 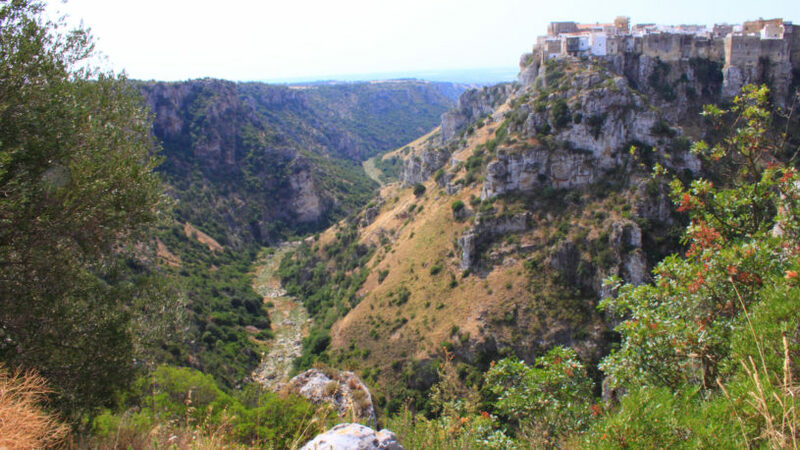 Part of this route is available for excursions and guided tours, to discover a world rich in history and biodiversity. 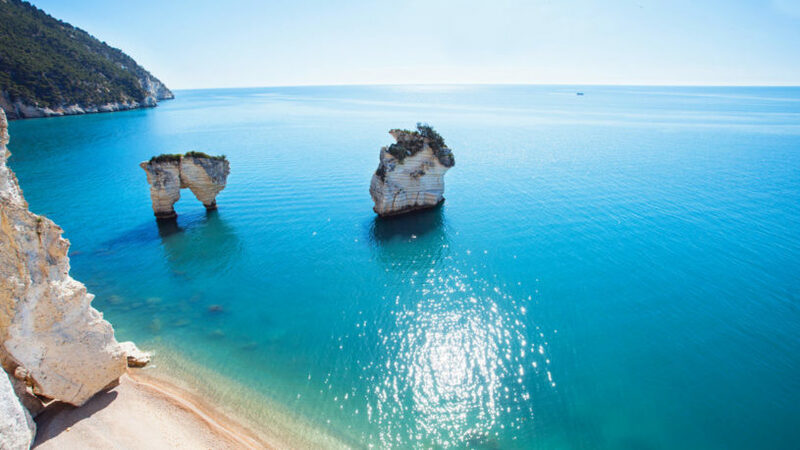 In the north, on the Adriatic coast, there are the town of Vieste, with its trebuchets, old fishing installations, and Peschici, the “Pearl of Gargano”, the popular tourist town on the sea caves, pristine bays and the old town full of craft shops. From here, by boat, you can reach the Tremiti islands, whose pristine beauty inspired the italian singer and songwriter Lucio Dalla, who, here, composed some of his most beautiful songs.